It has been revealed the intention of Government providing the public with added consumer protection in the form of independent investigation of complaints against lawyers in recent legislation has come to a grinding halt. So poor the effort which has been made by Kenny MacAskill's Justice Department, the legal profession itself has been allowed to take over most of the process, arguing at each stage it must have control over regulation of complaints at all costs, overriding any plans to give ordinary Scots a greater degree of safety in dealing with solicitors. 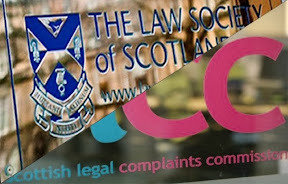 While most consumers and campaigners felt they would be getting a fairer deal under the Legal Profession & Legal Aid (Scotland) Act 2007, which created the new 'independent' Commission charged with investigating service complaints against Scotland's 10,500 solicitors, in reality little will change due to the Law Society's successful work in infiltrating the SLCC with around 40 members of its staff who for years have operated under the Law Society's policy to damage and destroy client complaints against solicitors at any cost. One of the reasons perhaps that so many lawyers across Scotland will happily pay around £307 as their annual levy to the new Scottish Legal Complaints Commission to ensure complaints are dealt with by ... their colleagues from the Law Society of Scotland who are being parachuted in by the Law Society to keep control over complaints against lawyers. 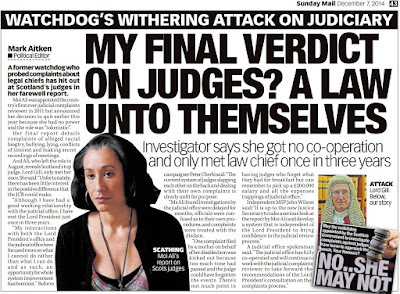 You can read more about how Jane Irvine, the Chairman of the Scottish Legal Complaints Commission feels the SLCC can ‘serve’ the public in an ‘independent’ capacity in the Law Society’s ‘Journal’ website here : On the scent …. 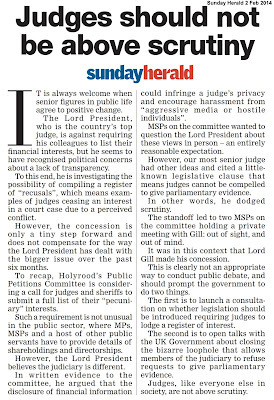 an interview which seems to indicate the SLCC will be on a short leash from the Law Society despite claims of ‘independence’. As things stand, there seems little or no effort on the part of the Scottish Government to do anything about the lack of independent regulation in the legal profession, which has seen spiraling levels of financial frauds against clients by solicitors, to the point that conducting legal business in Scotland is now widely seen as unsafe and to be avoided, after continuing scandals in both Scotland's civil and criminal legal systems reach uncontrollable proportions. A leading consumer representative asked for his thoughts on the weak consumer protection for clients of legal services in Scotland gave the following slamming indictment of just how troubled the Scots legal profession is : "You would be better withdrawing £2000 cash from your bank account and burning it in your garden than using the current framework of legal services in Scotland - because both actions now produce the same result … a waste of money and a considerable degree of personal harm." This is certainly bad news for us all, as at one stage or another we all need legal representation but to find trustworthy legal representation in Scotland seems to be harder than finding a needle in a haystack - a needle fast becoming a rarity taking into account some of the emails I receive from people who find themselves being ripped off right left and centre by lawyers whom the Law Society of Scotland will do nothing about. With recent further refusals to allow applicants other than solicitors into the legal services market, along with stalling by Mr MacAskill on the Law Society’s FOI exemption, which will run past 1st October 2008 while the allegedly ‘independent' SLCC will be FOI compliant .. the prospect of any consumer protection against rogue lawyers does not look good under the current regime where there appears to be no will to be seen to do the right thing and give the public a helping hand in complaints against rogue lawyers. In all this delay, and prevarication by the legal profession for increased consumer protection, there has to be of course, a motive. The motive, simply, is money. 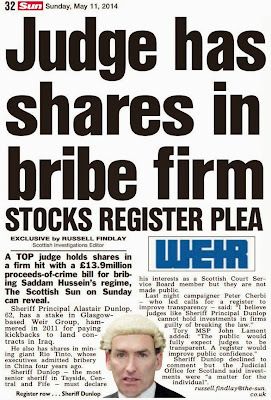 If you increase regulation or bring in independent regulation, the chances are the scams, client frauds, overcharging and poor service which is normally associated with legal firms in Scotland will go down, affecting lawyers personal income and profits .. just the same as would happen if the Scottish legal services market was opened up to competition – another issue still on the stalling books. Scottish law firms have posted huge profits over the past year in spite of the economic downturn that has engulfed the UK economy. In a survey of the UK's 100 largest law firms, equity partners at Scottish companies made an average of £343,000 profit, a 4% increase on the previous year, according to Legal Business magazine. 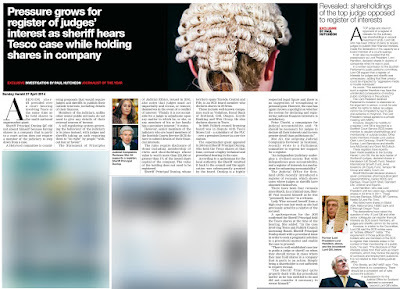 However, despite the current "rude health" of the UK's legal profession, the magazine warned that Scottish companies were among those which would face uncertainty as the UK's economic woes continue. Among the companies that appear to be thriving amid the credit crunch are Dundas & Wilson - Scotland's largest law firm - which saw a 23% increase in turnover to £74.8m. The firm's profit margin of 41% was the largest of the top 10 Scottish companies included in the survey. Equity partners at the firm - those that take a share in profits - made an average of £379,000 each. This year also saw Brodies, Scotland's fastest-growing law firm, see its turnover increase by 23% to £37m compared to last year. However, Tods Murray saw a drop in turnover for the second consecutive year, taking the company out of the Legal Business top 100 list. 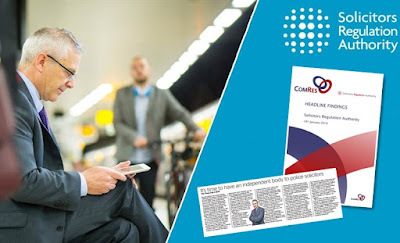 James Baxter, editor of Legal Business, said: "Taken at face value the UK legal community looks to be in rude health: UK firms compete well overseas, firms are billing well and clients are broadly happy paying. "Managing partners from some of the UK's largest firms have told Legal Business that they would be happy to achieve zero growth in the next 12 months, meaning that most are expecting to report a drop in profitability for the first time in a decade. "The credit crunch, whilst not showing much impact on this year's figures, has UK law firms worried. "There are precious few deals being done, the usually lucrative financial services markets have dried-up, and the commercial property market has all but stalled." 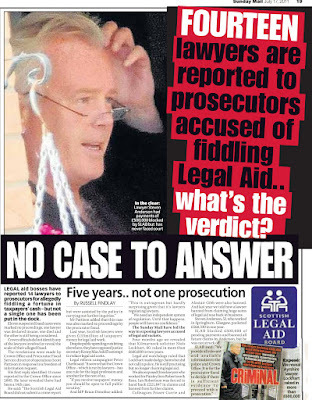 True to tradition, the Scots legal profession always fall back on deception, censorship and manipulation of the media & public opinion when things don't go their way, and in spectacular style, the Sunday Herald today has exposed the Glasgow Bar Association in a media manipulation scandal where it hired a Public Relations firm to attack the recent legal aid reforms, which are depriving lawyers and legal firms of legal aid income. While at first glance there may be no evidence of Law Society of Scotland involvement, you can be sure Law Chiefs at the Law Society's Edinburgh Headquarters in Drumsheugh Gardens knew all about what was going on, and tacitly supported the covert plan to kill off the widely supported reforms to legal aid, ensuring more money coming back into the legal profession's coffers. Chief Executive of the Law Society of Scotland branded a liar after FSA denies claims of intervention to block complaints body. Kenny MacAskill, the Justice Secretary is quoted in the Sunday Herald article with the following : "I regret that the Glasgow Bar Association have paid lobbyists in order to trawl around for mistakes. It doesn't serve them well. "We want to reward lawyers for doing their job, not have people playing the system. Unfortunately, it does seem that a small minority of lawyers want to persist in milking the system." Good old Kenny MacAskill - always wanting to ‘reward lawyers’ for doing their job, but at what cost to the rest of us in Scotland ? Does “this Scottish Government” owe the legal profession such an immense debt it must ensure lawyers continue to cover up for crooked lawyers and always put lawyers interests before those of the public ? So, the legal profession using PR firms and fake news stories in certain newspapers by lawyers themselves to promote their image.That is nothing new. 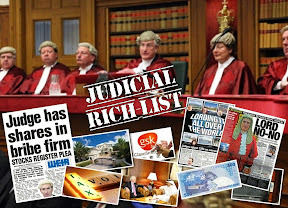 What is new is that such events are now being reported .. which is good - good for the public who should realise the Scots legal services market is dominated by corruption dodgy political alliances, and greed, putting the interests and safety of the client and public last. AT FIRST sight, the recent media coverage about how new criminal justice reforms were allowing yobs to walk away from their crimes with a fine seemed only to be a reflection of public concerns. 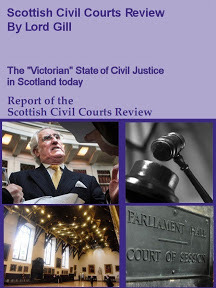 The last Scottish Executive's summary justice proposals, which came into force on March 10, were intended to speed up the system by keeping low-level criminals out of court and instead punishing them with either a fine or a warning. In practice, "reform" was allowing people charged with assault to get away with a £150 fine, a sanction which was bizarrely applied to two women who attacked a nurse with a glass. The result was a plethora of stories about "soft touch" Scotland and a barrage of criticism for the SNP government and prosecutors. 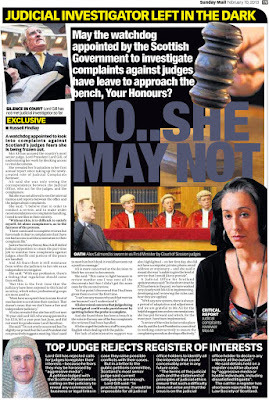 However, the Sunday Herald can reveal that much of the coverage was being driven by the Glasgow Bar Association (GBA) - a body representing the legal profession in the west of Scotland - which had hired a PR firm, McGarvie Morrison Media (MMM), to attack a key plank of the criminal justice system. A consequence of the fiscal fines system, otherwise known as "diversion", is that people charged with low-level crimes need not get bogged down in drawn-out court cases, thus depriving lawyers of legal aid. 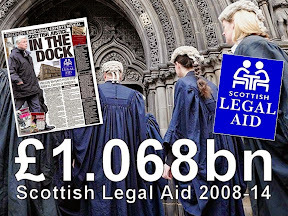 Statistics from the Scottish Legal Aid Board show how lucrative state cash is for law firms. In 2006-2007, firms received £122 million for work done. In other words, Glasgow's legal establishment has been bankrolling a secret campaign to attack a set of reforms that will reduce the subsidies for wealthy law firms. 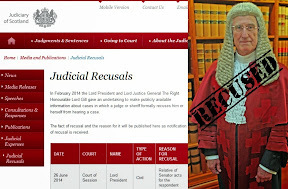 A leaked letter from last month between two solicitors makes clear MMM's remit to mount a campaign against a set of reforms that had widespread cross-party support at the time. "As you will probably know, they GBA have employed media consultants who have basically commenced a campaign through the Scottish Sun regarding diversion being used in serious cases rather than prosecuting somebody in court. The consultants are looking for any cases where it would appear that diversion has been used for something more serious than it should have." The letter continued: "Apparently the consultants are offering discretion and confidentiality and if any member has such a case they want to report to them they should send an email to john@mmm.pr." The email address was for John Morrison, a founding director of MMM, which for the last two months has placed stories and trawled for negative diversion cases on behalf of their well-paid clients. MMM, a Labour-supporting PR firm which donated £2000 to the party last year, lists a number of its clients on its website, but not the GBA. But the blurb on its site states: "We deploy our experiences, skills and contacts to ensure that MMM campaigns make headlines and achieve results." The firm's "discreet" strategy appears to have had one central plank: find bad examples of diversion and hand them to the media. It is a tactic that has certainly made headlines. A raft of articles in broadsheet and tabloid newspapers have focused on individual cases of diversion, which were accompanied by either statistics or obliging quotes from a member of the GBA. In one July report, published in The Sun, GBA past president Gerard Considine was quoted on the summary reforms: "I can't see how this is about protecting the public from harm." 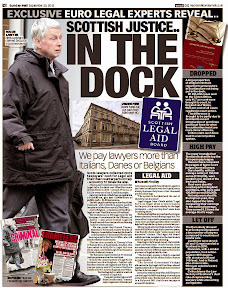 In an earlier article in the same newspaper, Considine had another criticism of the system: "This is undermining the credibility of the justice system." Sara Matheson, the current president of the GBA, also hit out at the new regime. "This is a matter that should concern the general public," she said. Another piece, in The Sunday Times in June, reported how lawyers had "compiled a dossier" of cases in which serious crimes had been "downgraded" to free up court time. This time, Edinburgh Bar Association president Kenneth Cloggie popped up with a quote: "It seems to be a bit of a lottery depending on the fiscal you get on the day." Cloggie's email address was also listed in a fax obtained by the Sunday Herald as the contact for suitable examples of "direct measures", such as fiscal fines, for use in a BBC programme on the matter. 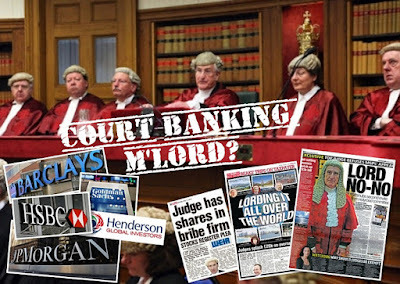 Morrison said of MMM's work: "Our company was recently appointed as short-term media advisers to the Glasgow Bar Association. There has been intense press and media interest in issues linked to summary justice reform and the use of fiscal fines. The GBA asked MMM to provide advice on how best to deal with inquiries from journalists and to help promote their point of view." He added: "The GBA have consistently argued that fiscal fines are not in the public interest, because some offenders who are guilty of violent and other serious offences are not being convicted through the courts and escape without a criminal record." Matheson defended the GBA hiring the PR firm. "The overwhelming motivation was to have some assistance with the press. They are helping us with all aspects of getting our message across," she said. "Our members are gravely concerned about diversion and the effect it will have on the public." On whether the legal aid aspect of the summary justice reforms was part of the reason for hiring MMM, she said: "That's certainly one aspect, but it's not the only driving force." Justice secretary Kenny MacAskill MSP, who concedes that there are problems with the system, said: "I regret that the Glasgow Bar Association have paid lobbyists in order to trawl around for mistakes. It doesn't serve them well. "We want to reward lawyers for doing their job, not have people playing the system. Unfortunately, it does seem that a small minority of lawyers want to persist in milking the system. "The two-month media blitz on the summary justice reforms, far from being a bottom-up process reflecting public anxiety, appears to have been a campaign manufactured by a PR company and paid for by a legal establishment that has a financial interest in resisting the new system." The bitter battle over who controls the 'independent' Scottish Legal Complaints Commission continues as spokesmen for the Justice Minister confirm that public sector staff from the Scottish Legal Services Ombudsman are effectively to be left in the cold on salaries and workplace opportunities. This is in stark comparison to staff from the Law Society of Scotland who are transferring over to the 'independent' SLCC with larger salaries (up to £18,000 more) and apparently greater prospects for career advancement and promotion, and all because it seems, the Law Society of Scotland says so. 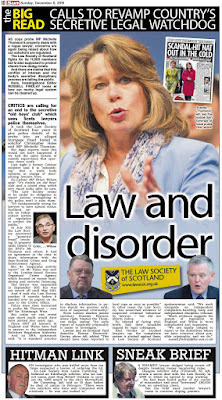 As I revealed in an earlier report on the latest round of problems to hit the Scottish Legal Complaints Commission, moves were being undertaken by the Law Society with the tacit approval of the Scottish Government's Justice Department to 'force out' staff from the former Scottish Legal Services Ombudsman's office, who have for years, investigated the way in which the Law Society of Scotland has so poorly investigated complaints against lawyers. One of the main fears of the Law Society is that the former Ombudsman staff will be outwith the control of the legal profession, and most probably feel no blinding loyalty to report home on cases and investigations into crooked lawyers which are in progress .. and more worryingly for the Law Society, the former Ombudsman staff may at times be prone to blowing the whistle on whitewashes of client complaints, which have been standard at the Law Society for nearly two decades. "Staff from the Law Society of Scotland and the office of the Scottish Legal Services Ombudsman are eligible to transfer to the Commission under the Transfer of Undertakings (Protection of Employment) Regulations (TUPE) and the Cabinet office Statement of Practice on Staff transfers in the Public Sector (COSOP) respectively. Staff consultations are still underway in both organisations and decisions on whether or not to transfer will be taken by the staff involved once this process has been completed." So ... while the Transfer of Undertakings (TUPE) regulations seem to be protecting the staff from the Law Society quite well .. it seems from background reports, the Ombudsman staff are being frozen out of discussions and decisions, in the hope they wont transfer over, and the Law Society can get its wicked way, stuffing the new Complaints Commission solely with its own staff ! Mr MacAskill continued : "Once the Commission is established, a harmonisation exercise will take place involving senior management and staff representatives from both former SLSO and former LSS staff who will discuss differences in employment terms and conditions and proposals for their resolution. The timing of this harmonisation is for the Commission to consider in due course." However, with no foreseeable increases in budget .. which the SLCC will have to work within, and the rich pickings of the SLCC members at £300 plus per day of attendance, it seems unlikely there is any great wish to match the £18,000 extra which Law Society staff will be demanding from the new Commission against those public sector employees of the former Ombudsman's office. An insider at the Scottish Government when asked for comment stated "There has been significant lobbying from the Law Society on the issue of their staff transferring to the new Commission and the Justice Department team either don't understand or don't accept the importance of having the former Ombudsman staff on board". A good and cunning plan then, to force out the poor Ombudsman staff, and see the Law Society of Scotland gets its way, ensuring that what was to be a new broom of independence in dealing with complaints against lawyers in Scotland, is staffed and controlled by the very people who have always been dealing with complaints against lawyers, and that is .. more lawyers. A source within the Law Society yesterday confirmed that plans were still going ahead to force out the Ombudsman staff from the new Complaints Commission, reporting to me in a stark comment : "It is being seen as vital the profession keep control over regulation of complaints at all levels in the new Commission.These Ombudsman staff cannot be trusted to tow the line if a conflict between the Law Society and the Commission arises". So there we have it - the Law Society can't allow anyone else to handle complaints against lawyers because if such a thing were to happen ... Scotland would find out just how corrupt some solicitors have become or have always been – as some could well attest to. 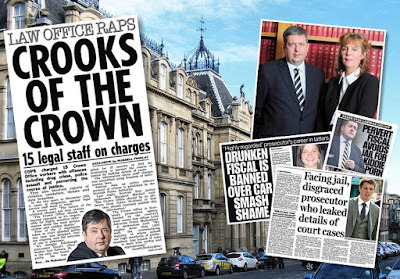 However, Scotland might also find out the histories of some of the Law Society staff who intend to transfer over to the new Scottish Legal Complaints Commission, and there is no shortage in information now coming out about what some of those individuals have been up to over the years. Indeed, the Law Society has become so concerned of revelations concerning the complaints handling records of their members of staff transferring over to the new Complaints Commission that a block has been put on naming and identifying those individuals, even by the new Commission itself. This secretive move by the Law Society is being seen as an attempt to prevent members of the public from finding out that Law Society staff who have ruined and mishandled so many complaints in their present positions will transfer over to the new Commission with the likelihood that once in place, they will revert to the old ways of whitewashing complaints against colleagues in the legal profession, or worse still, report back to the Law Society on every case they are handling at the new ‘independent Complaints Commission. Perhaps when clients are making complaints to the new Complaints Commission about their solicitors, they would also do well to ask about the complaints handling records of those Law Society staff who have been mishandling complaints for years in their former jobs at Drumsheugh Gardens ... and what a sordid tale of disclosure might be revealed. So, over again to the Justice Secretary Kenny MacAskill, who did of course say, he would protect the legal profession at all costs, even at the cost of public sector jobs it would seem ! 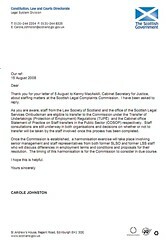 Emerging evidence after my article last week reporting the Justice Secretary Mr MacAskill’s appointment of a lawyer identified in a claims & complaints fixing scandal at the Law Society of Scotland , now indicates the Justice Secretary may have deliberately misused references to the Office of the Commissioner for Public Appointments in Scotland, or OCPAS as it is generally known, which performs its duties according to legislation to independently regulate Ministerial appointments. It seems the Justice Secretary felt, due to the nature of the tricky appointments of Martin McAllister and Lady Smith to the Judicial Appointments Board, his Department had to bring in an OCPAS Assessor to justify a series of appointments which now look increasingly like 'jobs for the boys’ .. or at least, jobs for lawyers …. 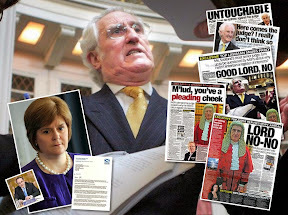 *Martin McAllister who was appointed to the Judicial Appointments Board by Kenny MacAskill, was identified by Cabinet Secretary for Finance John Swinney in a claims & complaints fixing scandal at the Law Society of Scotland, which sought to delay and destroy claims from clients & members of the public against well known crooked lawyers. 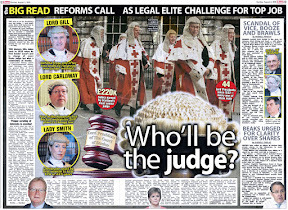 *Lady Smith, who was also appointed to the Judicial Appointments Board by Kenny MacAskill, saw her husband, David Smith only a few weeks earlier appointed, to the Scottish Legal Complaints Commission , also by Kenny MacAskill, giving Scotland a legal first in an unprecedented 'husband and wife team' on key judicial and legal regulation reforms. 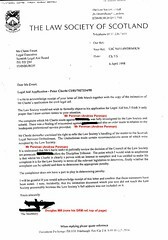 Since my article of last week, it has emerged through an investigation with OCPAS, the Justice Secretary and Justice Department may have knowingly and falsely claimed the OCPAS assessor had acted in her professional capacity as an OCPAS assessor and had followed and passed Mr MacAskill’s appointments to the Judicial Appointments Board. 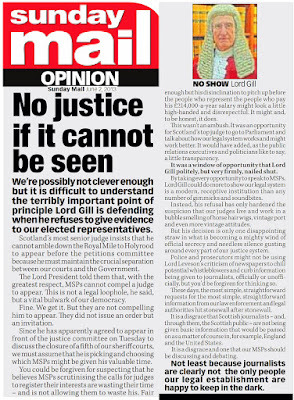 This therefore, seems to have been a clear and deliberate attempt by the Justice Minister and Scottish Government Justice Department to mislead the public and Parliament on the nature of key legal appointments. Justice Secretary MacAskill commented last week : "The Judicial Appointments Board currently operates on an administrative basis and is therefore not subject to OCPAS regulations. However, the selection panel included an OCPAS assessor and followed good recruitment practice in making the recommendations for appointment." OCPAS "We were not contacted by Scottish Government to assign an OCPAS Assessor to this appointments round. As these are not regulated appointments at the current time we would not have, in any case, been able to provide an OCPAS Assessor to oversee the round. The relevant Scottish Government sponsor team for appointments to this body will have entered into a private agreement with the individual [Anja Amsel] who oversaw the round." Late last week, after my report had been published, the Office of the Commissioner for Public Appointments in Scotland upon a brief investigation, ordered the Justice Department to re-write Kenny MacAskill's Press Release, ordering no reference be made to OCPAS under the circumstances, which then ended up as the following “However, the selection panel included an OCPAS assessor acting in an independent capacity and followed good recruitment practice in making the recommendations for appointment." It seems however, the Justice Secretary was determined to keep in the OCPAS reference, albeit tentatively, to justify his appointment of colleagues in the legal profession to key areas of recent reforms to judicial and legal regulation. While there is no suggestion at this stage that Ms Amsel did anything wrong, it remains questionable of Mr MacAskill why the Justice Department have been so reluctant to remove reference to her involvement despite requests from OCPAS to remove references to their department. A source within the Government who did not wish to be identified said today that "Mr MacAskill and the Justice Department seem to have felt that dragging OCPAS into the appointments to the Judicial Appointments Board would be advantageous to the Government, weakening the independence of OCPAS and any possibility of a further investigation by anyone into Mr McAllister & Lady Smith's appointment to the Judicial Appointment Board." I understand that when bodies choose to do so they may refer to Government for a list of individuals who are willing to work on unregulated rounds on a freelance basis. 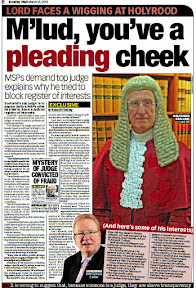 Under no circumstances are such individuals permitted to advise that they are doing so in the capacity of OCPAS Assessor"
That seems fairly clear, and Mr MacAskill was well aware of those terms, so why did he choose to use OCPAS to justify what now appears to be a questionable appointments process to panel which appoints Scotland's judges ? OCPAS Statement : "[OCPAS has...] discussed the press release with the relevant Scottish Government sponsor team and explained our expectation that no reference should be made to the use of OCPAS Assessors (OAs) unless they are working in that capacity. OAs may only work in that capacity on appointment rounds regulated by the Commissioner. As advised previously, appointments to JABS are not currently regulated by the Commissioner"
"The Commissioner has already changed OCPAS policy on the type of work that OCPAS Assessors may do such that in future no acting OCPAS Assessor may work as an independent assessor on unregulated appointments rounds. Revised service level agreements have been issued to all OAs to reflect that change in policy." A source within OCPAS then went on to confirm that Ms Amsel who was asked by the Justice Department to sit in on Kenny MacAskill's appointments selection is to leave OCPAS this year : "Anja Amsel and one other assessor, who are working notice on the old service level agreements which allowed this practice, are ceasing to work for OCPAS this year." OCPAS have now been asked to investigate why their office has been misused in this way in an apparent attempt to justify the appointments to the Judicial Appointments Board. Well done Mr MacAskill. 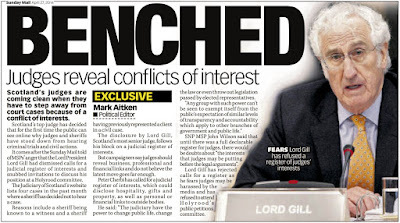 How many more organisations and people will you rope in to smooth over courtesy appointments from the legal establishment to keep business, expenses claims, salaries and regulation among themselves ? Mr MacAskill, how about some showing some Ministerial responsibility towards the Scottish public instead of putting the legal profession above ordinary people’s rights and consumer protection ? 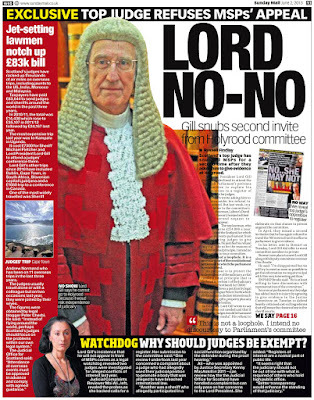 Is it not about time we had a truly independent regulator of Scotland’s legal profession, instead of Law Society of Scotland string pulling and your acquiescence to it ? It has been revealed that staff from the Scottish Legal Services Ombudsman who are intending to migrate to the new Scottish Legal Complaints Commission will face lower salaries and lower employment prospects and promotion possibilities than their counterparts migrating over to the new Commission from the Law Society of Scotland. As if that isn’t enough to take, the former Ombudsman staff will have to endure concerted attempts by the legal profession to replace them in favour of yet more staff from the Law Society itself, in what is being seen as a well planned attempt by the legal profession to force out anyone from the new Commission who isn’t connected with the Law Society of Scotland. 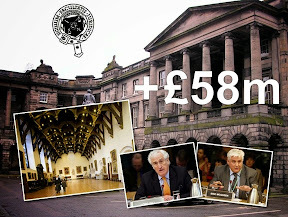 * former Ombudsman staff who are migrating to the SLCC will receive up to £18,000 less than former Law Society of Scotland staff who are themselves undermining migrating over to the new Commission under TUPE legislation, with similar but apparently far less equitable provisions for public sector employees for the Ombudsman's staff transferring over. * Law Society staff are to be considered for managerial and senior posts (rumours that some have already been appointed via strong lobbying from the Law Society itself) where former staff from the Ombudsman are to be excluded from any possibility of promotion. * Law Society staff who are promoted to senior positions and who will be in charge of former Ombudsman staff, will be able to influence and control investigations still being carried out into their work from their time at the Law Society. 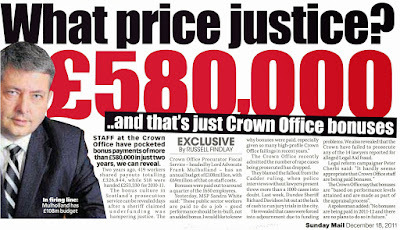 *The Scottish Government, aware of the huge disparity in salaries between Law Society staff and former Ombudsman staff, are rumoured to be hoping that if it all goes quietly, former Ombudsman staff will leave the new Commission over their lesser salary and job entitlements, to be replaced by Law Society staff who are apparently already being lined up to replace anyone considering leaving ! 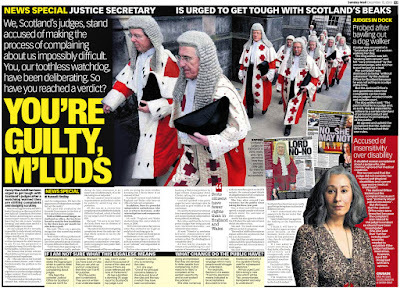 According to sources within the Law Society itself, the campaign is being orchestrated to "hound out" the former members of staff from the Scottish Legal Services Ombudsman's office, who the legal profession apparently see as "outsiders" who, according to one solicitor “should not be given any say in how complaints against lawyers are handled”. 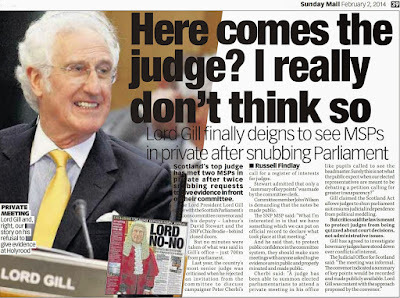 Dreadful comments from the legal profession, if of course, expected. I for one feel there shouldn’t be any Law Society staff working at the new Commission because the Law Society and its teachings in the field of regulation, simply cannot be trusted, ever. So, the Ombudsman staff have been left to fend for themselves in their new posts at the SLCC, while the Law Society staff get their full salaries ! Disgusting to say the least. I wonder how the former Ombudsman staff feel about that one … what a disgraceful situation to be in for the few people from the Ombudsman’s office who are giving the public the sole hope of independence within the new Scottish Legal Complaints Commission. Well, it seems they will have to remind the Law Society of that one, who are apparently now busy arranging positions for their own staff to take up at the new Commission … and we all know that when the Law Society wants something, it usually gets it. 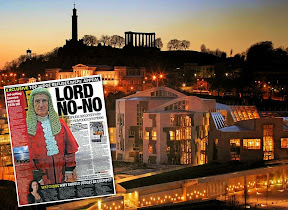 There is little doubt among those in the know, the former Ombudsman staff may well find themselves at the bottom of the barrel when it comes to appointments to managerial and senior posts at the new SLCC – hardly any inspiration to stay where one is being treated worse than those migrating over from the Law Society of Scotland. However, leaving staff promotions up to the new Commission wont work I fear, as much of the Commission itself are members of the Law Society of Scotland who will be familiar with their staff who are migrating over from the Law Society, leaving the former Ombudsman staff out in the cold. Without doubt, the legal profession are in a state of fear the former Ombudsman staff, or "outsiders" as the Law Society seem to feel they are, will break some of the ‘lawyer covering up for lawyer’ habits which have plagued regulation of the legal profession in Scotland for decades, and this latest attempt, to take over the Scottish Legal Complaints Commission itself, is certainly a move in that direction. The Law Society would prefer to have the new complaints commission staffed entirely by members of staff from Law Society itself, and unfortunately the former Ombudsman staff now find themselves in the middle of a war with the legal profession to see it gets its way. With possibly only Jane Irvine, the new Chairman of the Scottish Legal Complaints Commission, being the only champion of her former staff from her time as Scottish Legal Services Ombudsman, positions are looking somewhat precarious for not only the staff at risk but also the credibility of what was to be an independent complaints commission, which is now mostly staffed from the very organisation, the Law Society of Scotland, whose problems brought about the new commission's existence in the first place. 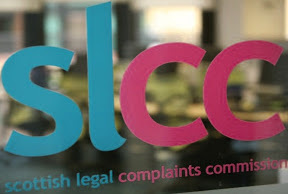 Jane Irvine, Chairman of the SLCC, sought to defuse the situation by commenting : "I think you have to bear in mind that there is a complex picture here, Law Society staff do not know everything and we are creating a new organisation with a new culture and a new drive towards resolving complaints swiftly and fairly." Yes, I agree of course, Law Society staff who are migrating over to the new SLCC have been trained to do the opposite of what they are about to do, for years. 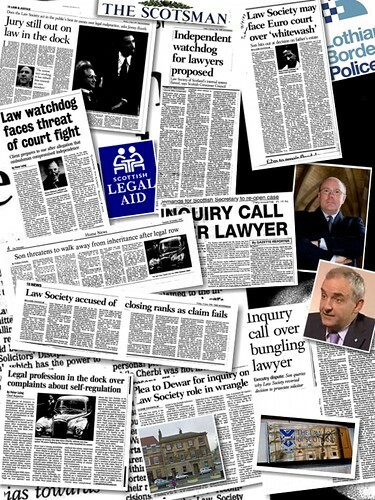 Decades have went by while those same Law Society staff, now transferring over to the SLCC have thwarted client complaints at every turn, made sure claims for solicitors negligence, even claims for solicitors theft from client funds have gone unanswered or have been deliberately delayed to the point they can no longer be pursued in a court of law. Creating a new organisation with a new culture and a new drive towards resolving complaints swiftly and fairly, will be difficult, considering the habits, and misplaced loyalties which will inevitably resurface in the Law Society staff, some of whom themselves aspire to be lawyers if not already qualified to be. Kenny MacAskill – Scottish Govt. 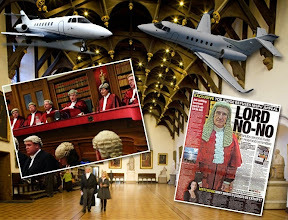 owes lawyers a great debt – to be repaid taking away the independence of the SLCC perhaps ? Jane Irvine countered any attempt to control the SLCC from outside : "It is not the Law Society who control the new body. We are entirely independent." I hope Jane Irvine is correct, and I do support the independence of the Scottish Legal Complaints Commission as it was intended to be, but most people who are about to go into court against the Law Society say the same thing .. something like .. “the Law Society doesn't control the court, we will win ..” and that is the end of their case and the end of their access to justice as we all know only too well. If I may make a suggestion, one I know which wont be taken up but one which seems more consistent with the term ‘independence’ than what is currently being delivered in the SLCC : keep the former Ombudsman staff, and look for new recruits who don't come from the legal profession or the Law Society of Scotland. Sadly however, the Law Society of Scotland, through its determination to maintain control of all aspects of regulation of the legal services sector, wont be allowing anything as honest, accountable and acceptable as that suggestion to become reality. When questioned today over why former Law Society President Martin McAllister was appointed to the Judicial Appointments Board, despite being identified by Cabinet Secretary John Swinney MSP in memos detailing a claims & complaints fixing scandal operted by the Law Society of Scotland, Justice Secretary Kenny MacAskill denied through his spokesman, any knowledge of the offending memos, which have been available at the Scottish Parliament, in the media, and even on the internet for some time now, and which continue to rock Scotland's legal establishment. The now well known memos to everyone except the Justice Secretary himself, were revealed by the Cabinet Secretary for Finance John Swinney MSP, who identified a particular memo from Law Society Chief Executive Douglas Mill to the then Law Society President Martin McAllister as being the key to a claims & complaints fixing scandal which saw clients claims against crooked lawyers ruined by a well practiced policy of delay & destruction of claims & complaints against multiple firms of crooked lawyers. The memo of 5 July encourages "a summit meeting on the up-to-date position"to be held to look at "both the complaints and the claims aspects." That rather suggests that the Law Society has been involved. The claim remains unresolved to date and yet the memo is dated 5 July 2001." 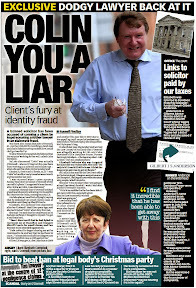 The claims fixing scandal, which involved senior members of staff at the Law Society of Scotland, apparently headed in an operation by Law Society Chief Executive Douglas Mill, saw a policy implemented by the Law Society and some of the UK's largest insurers, Royal Sun Alliance PLC, and Marsh UK to delay and destroy client claims and complaints against notorious Scots legal firms with poor regulatory records. Could you sign this letter ? I have discussed with Alistair Sim and I think a holding letter is ideal. Alistair confirms that there is never any question of the Mackenzies sending out hard copy letters. There is a saga here and you will recall I intimated this to you and David by copying Alistair Sim's email of 8 June. David has asked for a one page summary on the Mackenzie's position, which is quite frankly an impossibility !. The Mackenzies I would say are different from some of the other complainers in as much as they have several valid claims, they have been let down by a series of solicitors but they are unreasonably in their expectations of quantum etc. Rather than trivialise matters I would recommend that the four of us i.e. you, me, David Preston and Alistair Sim all get an hour or so together some time in July to have a summit meeting on the up-to-date position looking at both the complaints and claims aspects. there is no doubt that Mr Mackenzie is intelligent and well organised individual who would unlike some of the other thorns in our flesh, come over very well at a JHAC investigation. Clearly the memos do indeed, identify the then Law Society President Martin McAllister as being part of the fray which prevented the MacKenzies claims & complaints against a number of solicitors from progressing to any reasonable conclusion. Indeed, since the date of the memo (2001), none of the claims identified within the memo, or by John Swinney in his confrontation with Douglas Mill before the Scottish Parliament's Justice 2 Committee during 2006 have been settled. Not one. In fact, not one claim or complaint by those who submitted their cases to the Justice 2 Committee during 2006 have been settled. Not one. So in conclusion, Douglas Mill’s memo to Martin McAllister has resulted in a very successful policy by the Law Society of Scotland of protection for several firms of corrupt solicitors while significant and long lasting financial harm has been caused to the damaged lives of clients. Mr McAllister has now been appointed to the Judicial Appointments Board, where he will be in part responsible for the appointment of lawyers to the positions of Sheriffs and Judges. Inevitably some of those lawyers who come before the Judicial Appointments Board will have not the best of regulatory records, where complaints have been poorly handled by the Law Society of Scotland, possibly to the point those complaints have been dealt with by the ‘Douglas Mill doctrine’ contained in the memo to Mr McAllister, which is clearly ‘destroy the client’s access to justice at all costs’. Is it fair to have lawyers appointing lawyers to positions of Judges ? 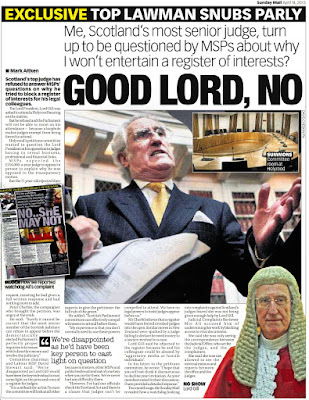 Well, eight years on from the date of Douglas Mill’s memo to Mr McAllister, there have been no improvements in regulating the legal profession, and still, the Law Society of Scotland impedes and prevents clients access to justice when it sees fit. What change ? The Law Society of Scotland hasn’t changed one bit over the past ten years, or the past twenty years for that. There is still a claims and complaints fixing policy to see that no claim or complaint goes to a fair & proper conclusion and clients who choose to complain are victimised almost to the point of death. 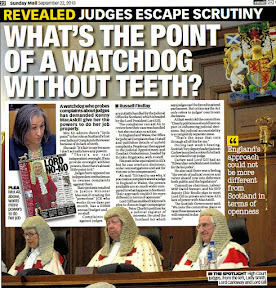 Christine Grahame’s Justice 1 Committee of 2001 forbade members of the public to appear before it to testify as to their experiences with the Law Society of Scotland, while lawyers, more Law Society officials, and just about anyone who could be dragged out to support the idea of self regulation (lawyers looking after complaints against lawyers) were allowed almost free reign to appear before the then Justice 1 Committee at the cost of excluding the Scots public. 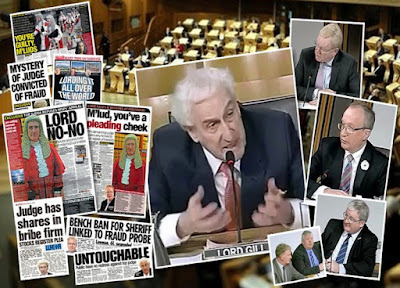 It took a further five years until 2006 when members of the public, ordinary Scots like you and I, were able to appear at Holyrood during the 2006 LPLA Bill inquiry by the Justice 2 Committee and tell of how scandalous the Law Society of Scotland had treated them. Marsh UK Director Alistair Sim to Law Society Chief Executive Douglas Mill - Collating information on the MacKenzies and throwing some red herrings at the Justice Committee .. I have a couple of faxes from the MacKenzies intimating the sort of comments they say they will be conveying to the Justice Committee on 31 July. These do not call for any response from me. 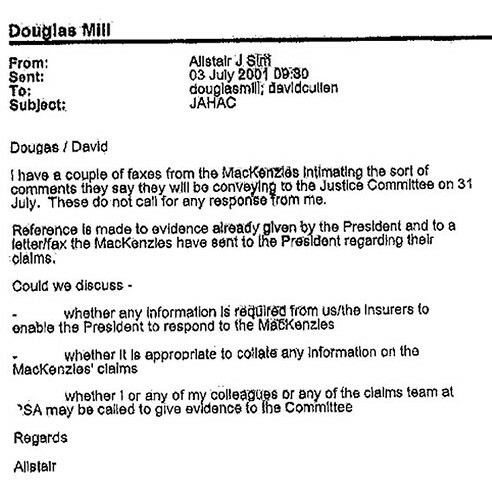 Reference is made to evidence already given by the President and to a letter/fax the MacKenzies have sent to the President regarding their claims. 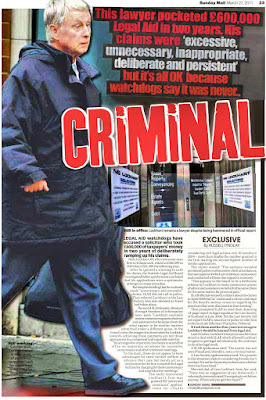 -whether I or any of my colleagues or any of the claims team at RSA may be called to give evidence to the Committee. 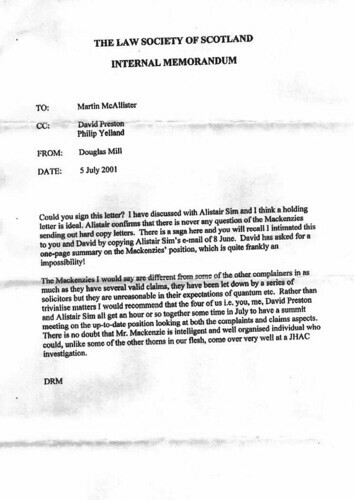 Clearly Mr McAllister was privy to a great deal of information as Law Society President, information which could have ended the suffering of many clients who had been trying to pursue claims or complaints against their solicitors, but as the facts show, no action was taken by Mr McAllister to alleviate clients problems at the hands of his colleagues Douglas Mill, Philip Yelland & others at the Law Society of Scotland. To a certain extent of course, Martin McAllister was but a tool of Douglas Mill, as the President of the Law Society of Scotland is more of an honorary position, the real power lying with the slightly dictatorial position of Chief Executive. Clearly Mr McAllister could have done more, said more, and helped clients who were caught in the Douglas Mill doctrine much more than has happened, because as we hear from Mr Swinney himself, no client, no claim has been settled, not one. 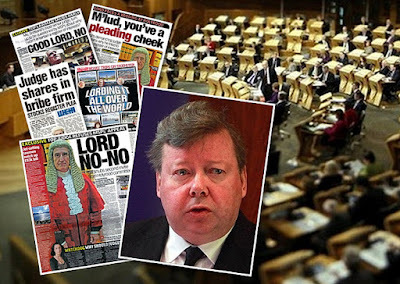 Perhaps the memos identifying Mr McAllister in the claims & complaints fixing operation run by the Law Society of Scotland should have surfaced as a possible barrier to being appointed to the Judicial Appointments Board, which is a position itself responsible for the appointment of lawyers to positions on the judiciary. Before I quote the Justice Secretary’s Press Release on the McAllister appointment, I feel a footnote is required on the second appointment contained in the Press Release, that of Lady Smith. 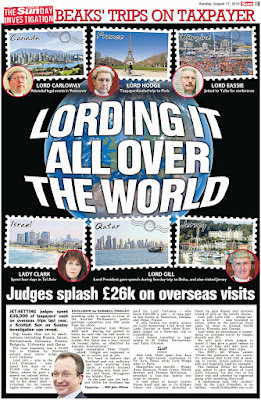 Lady Smith, appointed along with Martin McAllister, is the wife of David Smith, who was of course, appointed by Kenny MacAskill to the Scottish Legal Complaints Commission – to examine complaints against other lawyers. The Cabinet Secretary for Justice today announced the appointment of new legal members to the Judicial Appointments Board for Scotland. Lady Smith has been appointed as the Senator member to replace Lord Wheatley whose term of office came to and end in June. Lady Smith's appointment is for three years from July 1, 2008. Martin McAllister has been appointed as the solicitor member of the Board to replace Michael Scanlan whose term comes to an end later this year. Mr McAllister has been a solicitor since 1980. He was President of the Law Society of Scotland from 2001 to 2002 and is a partner of Taylor and Henderson, Solicitors in Saltcoats. Mr McAllister has been appointed to the Board for a period of three years. He will take up his appointment in October. These new appointees replace members who are retiring this year. The composition of the Board i.e. five legal and five lay persons remains unchanged. Both appointments are part-time and carry a commitment of around 20 - 30 days a year. Mr McAllister will be entitled to a daily fee of £290. Lady Smith, being a serving judge, receives no fee for her attendance. The appointments of the new solicitor member followed recommendations to Scottish Ministers by an independent selection panel chaired by the Rt Hon Lady Cosgrove, recently retired judge of the Court of Session. 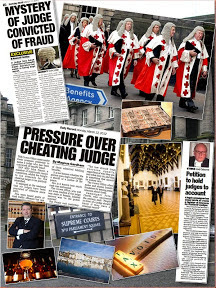 The Judicial Appointments Board for Scotland was set up in 2002 with a remit to advise Ministers on the appointment of Judges, Sheriffs Principal and Sheriffs (both full-time and part-time). There are ten members, five legal members (a Judge, Sheriff Principal, Sheriff, an Advocate and a Solicitor) and five lay members including Sir Neil McIntosh as the lay Chairman. The Judicial Appointments Board currently operates on an administrative basis and is therefore not subject to OCPAS regulations. However, the selection panel included an OCPAS assessor and followed good recruitment practice in making the recommendations for appointment. Despite the promise of 'a new era' in dealing with complaints against crooked lawyers and attempts to improve the appallingly poor quality of Scotland's overpriced legal services market, the Law Society of Scotland are still choosing to undermine the very foundations of client care, with more of the usual policies, sanctioning lawyers disgraceful treatment of clients to the point of ruin. “When confronted by a large legal bill of approximately £10,000 from the defenders in a personal injury case I instructed the solicitors then representing me to lodge a motion to the Court of Session on basis you outline, that is, the clear potential for a serious conflict of interest arising given the Auditor of the Court of Session would be ruling on matters relating to a fellow professional's expenses. Recently there has been an upswing in 'profession orders' from the Law Society to solicitors to dump clients who are either complaining against another solicitor, or are trying to lodge court cases for negligence or financial recovery of damages from lawyers who have ruined clients. I am writing to you with reference to your client Mr ****'s negligence claim against Messrs **** & **** . I would emphasise this is private correspondence between us which is under no circumstances to be disclosed to your client. I note your client is seeking to have the various papers he is in possession of relating to the investigation of the complaint against Mr **** submitted in evidence for his negligence claim. I also note from the terms of your letter your client apparently is insisting on calling witnesses from the Law Society of Scotland who took part in the investigation of the complaint made against Mr ****. In consideration of the above information you have furnished us, I recommend you withdraw from acting from your client immediately and make it as difficult as possible for any potentially dangerous material to be returned to your client in the file. * I have been asked to remove names & identities of those concerned for now, on the instructions of the client who sent me the letter. I, of course, am not surprised in the slightest at the above letter, as this is a well trodden path for the legal profession when dealing with clients who have been ruined by one of their colleagues. 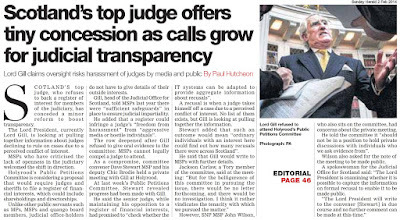 It just goes to reinforce what has already been reported by myself and attested to by others over the years, the Law Society of Scotland is, a corrupt institution, and must be denied any future regulatory role in complaints or client claims made against solicitors. I am not surprised ... why ? 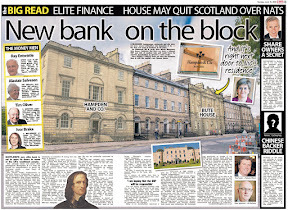 Well, just look at a few similar letters I have reported on in the past .. together with input from Cabinet Secretary for Finance Mr John Swinney (SNP) who bravely exposed another such letter in the Scottish Parliament itself. I refer to your letter of 30 July which my colleague Mary McGowan responded to during my absence on annual leave. I would ask you to note the reference number on this letter which is in fact the correct reference number rather than the reference number quoted on the previous correspondence to you which relates to the subsequent complaint made by Mr Cherbi against Andrew Penman which is currently held in abeyance until such time as the negligence action has concluded. I think that I should also draw to your attention at this stage terms of Section 56A of The Solicitors (Scotland) Act 1980 as it seems to me that this is relevant to the issues which you are seeking to raise. In terms of sub-paragraph (1) the taking of any steps under Section 42A (2) of the Act (that is a finding of inadequate professional service) shall not be founded upon in any proceedings for the purposes of showing that the solicitor in respect of whom the steps were taken was negligent. In addition in terms of sub-section (2) any award of compensation made in respect of a finding of inadequate professional service may be taken into account in any computation of an award of damages to be made following on negligence proceedings. I thought it only proper given that you had written to this office that these matters were drawn to your attention. 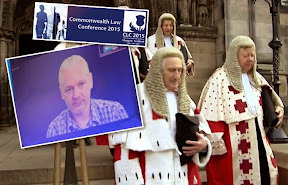 So, what was Mr Yelland doing writing to my lawyer telling him not to take my instructions on submitting the evidence of the complaints investigation against Andrew Penman which I wanted heard out in the Court of Session ? I write to acknowledge receipt of your letter of 20 March together with the copy of the intimation of Mr Cherbi's application for civil legal aid. The Law Society would not wish to formally object to his application for Legal Aid but, I think it is only proper that I draw certain issues to your attention. The complaint which Mr Cherbi made against Mr Penman was fully investigated by the Law Society and upheld. there was a finding of misconduct made against Mr Penman and also an order made in relation to the inadequate professional service provided. Mr Cherbi thereafter exercised his right to refer the Law Society's handling of the matter ot the Scottish Legal Services Ombudsman. the Ombudsman made certain recommendations some of which were accepted by the Law Society. It is understood that Mr Cherbi seeks to judicially review the decision of the Council of the Law Society not prosecute Mr Penman before the Discipline Tribunal. the point which I would wish to emphasises is that whilst Mr Cherbi is clearly a person with an interest to complain and was entitled to make his complaint, it is for the Law Society in terms of the relevant legislation to determine, firstly whether the complaint can be upheld and then to determine the appropriate penalty. The complainer does not have a part to play in determining penalty. I will be grateful if you would acknowledge receipt of this letter and confirm that these commends have been noted. I note, incidentally, that the intimation document which you sent did not reach the Law Society presumably because the Law Society's full address was not included on it. 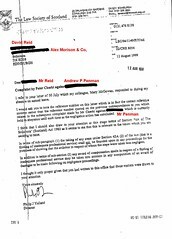 These letters on my own case are quite a common occurrence when clients of crooked lawyers find they can no longer gain access to justice or legal representation, the reasons for that being clear in the 'professional orders' handed down to solicitors from the Law Society, however, it is very difficult for a client to get hold of such material, believe me. 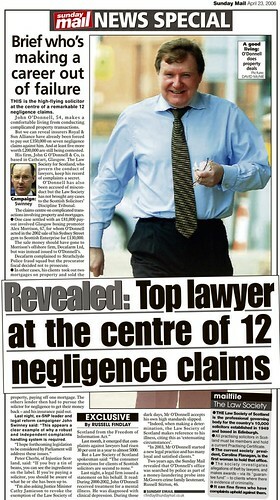 In one now famous case where there was a 'leak' from the Law Society of Scotland on the personal memos of Douglas Mill & others, did the true extent of the Law Society's ability and determination to prevent members of the public from obtaining access to justice in claims against crooked lawyers. 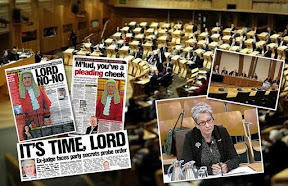 The determination of the Law Society to keep such a deniable policy afloat even led to it's Chief Executive and senior staff appearing before the Scottish Parliament and simply telling lies to deny what has become obvious to all - a policy to protect crooked lawyers at any cost whatsoever. 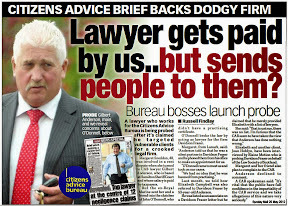 Law Society Chief Exec Douglas Mill – despite what my own memos say, I never fiddled complaints against crooked lawyers ! So, there we have it folks, for "Client Care", read "Client Control", and for "access to justice" read "control of access to justice". 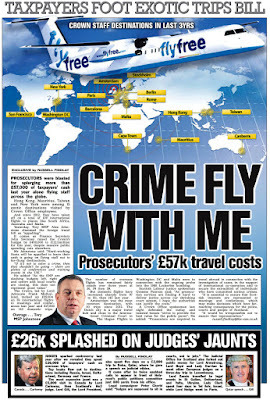 Well, identifying areas which give rise to client concerns and complaints shouldn’t be too difficult … lying to clients, cheating clients, embezzling clients finds, ripping off the estates & wills of dead clients, stealing clients land & property … all areas which could give rise to client concerns & complaints, yes ? Suggesting ways of avoiding the above … well .. that would be teaching and ensuring much higher standards of legal service, by keeping a watchful eye on the profession (which the Law Society has obviously not been doing) and ensuring that lawyers don’t continue with their present attitude of ‘lets rip off clients because we know we can get away with it’. Putting forward ways of dealing with the above … well well well … I have a few things to say about that, as I’m sure many of you do too ! 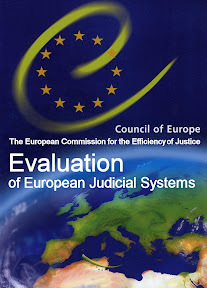 but put simply, an effective, independent regulatory body, fully accountable and transparent, with strong powers of enforcement, would just about do the trick, and of course, not forgetting opening up the legal services market fully to competition, to ensure that when lawyers feel they have to boycott an individual’s right of access to justice, that individual can still go somewhere else. Client Care and avoiding client dissatisfaction has always been important in trying to avoid complaints. 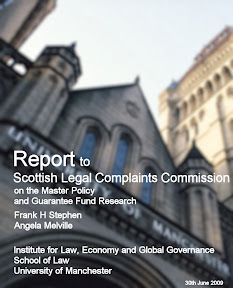 The creation of the Scottish Legal Complaints Commission dealing with service complaints alone will see a change in the regulatory structure in 2008. The aim of the event is to try to ensure that practitioners are aware of these issues and to give an indication in general terms about how the Commission is at this stage developing. If the legal profession want to hear from clients themselves (which they obviously don't), why not let in clients for free ? 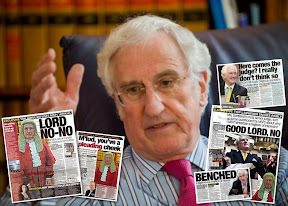 Could it be that Philip Yelland would rather order solicitors to drop their clients, not take their instructions or see to it they never get access to legal services again, rather than teach how clients should be respected and not ripped off or have their access to justice limited ? 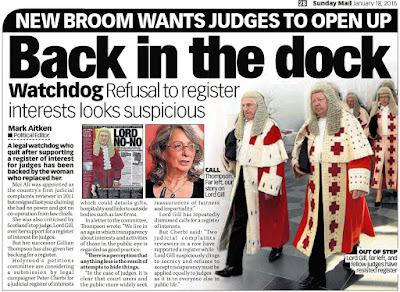 Perhaps a good idea now would be for Jane Irvine, the Chairman of the 'new' and supposedly independent Scottish Legal Complaints Commission to hold some client care conferences at the SLCC and get the public perspective on how client care should develop, not the wishes orders from the legal profession itself.